… the wait is nearly finished. The Portugal Sapphire will be published in summer 2013. Pardon my radio silence recently, but I’ve been preoccupied with writing two other books and creating paper versions of all my existing full-length titles. That’s all finished now. I’ve plunged back into the world of Ainsley Walker, of missing gemstones and foreign travel and sophisticated mystery. 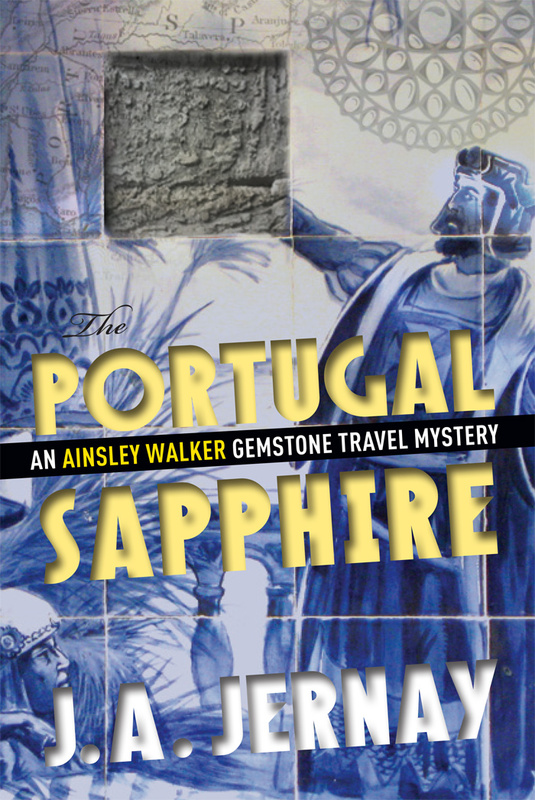 For those of you hoping to glance behind the curtain, here’s a peek: I have plans for at least four more titles after the Portugal Sapphire, all in various stages of research. And even more beyond that. I’m blazing to write; you love to read. Fact is, we’re a match made in heaven. I first discovered your wonderful books last year as I was getting ready for a two month trip to Argentina & Uruguay, wishing for a fun but informative good-read mystery novel set in those countries…and voilà ..found yours! I was in Argentina for the International conference in my field but stayed on to improve my Spanish and tango. This year the International Conference was in Switzerland so I came to Spain to continue to practice my Spanish. I have visited Spain in the past and so decided to go to Portugal since I’ve never been there before. I was wishing that you would write about Portugal…and then read at the end of the Puerto Rico Pearl (even though I wasn’t in Puerto Rico, I’m hooked on your books! )…that voilà encore..the next one takes place in Portugal! I’ll be there next week…so my question is…when will I be able to get it? Thanks Lucinda, I appreciate the support! You can expect the next book in August. Meanwhile, have fun in Portugal. It’s easy travelling — there is virtually no crime, and almost everyone under the age of forty speaks English. If you can, try to spend a couple of days in Evora (my personal favorite). Let me know the highlights! Thanks for your response! I’m in Lagos Portugal now…too bad I won’t be able to read the Portugal Sapphire while I’m still here! But at least in August, I’ll be able to picture everything. I’ve been researching how to get to Évora from here…and it’s pretty complicated. There is no bus, there are no rental cars available ( that i could turn in at a different location) and the train leaves at 6:00 in the morning, involving 3 changes. I could only spend one day there before having to get to Lisbon. Sooo, would you tell me a little more about why it is your personal favorite? It’s Thurs morning here and I’m leaving tomorrow morning for either Évora or Lisbon. Also, I’m so glad to hear that you have four other adventures lined up for Ainsley! You asked for ideas from your readers…so, I’m hoping for Spain, Brazil, Peru & Macau. That’s all staying with the Spanish/Portugese theme you’ve got going…but what about expanding into French, both France and Montreal? Evora has the most interesting history, bar none, of any city that I visited in Portugal. Five successive civilizations, remnants of which are piled upon one another in a VERY walkable and small city center (a UNESCO World Heritage Site). Two days and one night is optimum. Thanks so much JA for your timely reply!! After hearing back from you, I was planning to go to Évora but woke up that morning feeling rotten…the start of a deep chest cold. This trip has been very intense, lots of incredible adventures…but i took it as a sign from my body that it was time to rest. So I took the direct bus to Lisbon and stayed in my lovely hotel room for two days re-reading your books on Uruguay and Argentina for fun! Wow! I enjoyed them the first time I read them before I went there…and felt like I learned a lot. But now after having spent 4 months there last year, I am SOOO impressed by how much you really nailed it with both books! So many perfect details woven in, from eating ñoqui on the 29th to how much the Uruguayans hate the Argentines to what chamuyeros Argentine guys are to the lunfardo you used without translating (i loved that since i understood it:-))) not to mention how eloquently you captured so many aspects of Argentina, the backdrop of the Dirty War, Boca Juniors, tango (I would have liked even more of that since tango is my own personal obsession) Patagonia…there are just so many layers to your stories. And absolutely everything that you wrote rang true to my experiences in both countries…in fact, as a cute blonde myself, i got pretty much the same piropo from a guy on the Buquebus. But actually, I enjoyed being told all day long every day how beautiful I am…even if it is chamuyo! And also, reading your book again helped me with some business negotiations with an Argentine, so thank you so very much in so many ways! I can’t wait to read your new book about Portugal…and I’m disappointed that I didn’t make it to Évora this time, since I’m guessing that will figure in the plot. A friend from the conference, João, did take me to Sintra today though and he said if I come back, he’ll take me to Évora next time. I fly home to San Francisco tomorrow.